Investment planning begins when you have a clear vision of your financial goals and objectives. Whether you are planning for retirement, your child’s education, or re-balancing your investments, having an investment strategy in place can take the stress out of your mind. With our team of tax and investment consultants, we can create an investment plan based on your goals, comfort with risk, and time horizon. RRSPs give individuals the incentive to save towards their retirement. This incentive comes in the form of tax deductions. Any contributions that are made to an RRSP are deductible from your income for tax purposes, so they have the effect of reducing tax for the year. A tax-free savings account (TFSA) provides Canadians a way to earn investment income without having to pay tax. Individuals, 18 or older and who have a valid social insurance number can hold a TFSA. According to Statistics Canada, the post-secondary education inflation rate has tripled between 1990 and 2016 . Erring on the conservative side and using an inflation figure of 5% and 7% for tuition costs only in the above example, the future cost of education becomes $267,135 and $375,172 respectively! The Government of Canada provides further incentive to individuals saving for their children’s education through the Canada Education Savings Grant (CESG). The government will make a matching grant of 20% of the first $2,500 contributed each year to the RESP. For families with net incomes between $47,630 and $95,259, the additional grant is 10% on the first $500 of contributions. For more detailed information regarding RESPs, Grants & Bonds, please visit the Government of Canada website. Wait a while – Your child may change his or her mind about going to school. RESP accounts can remain open for 36 years. Choose a new beneficiary – You can name an alternate beneficiary to receive the RESP income. In a family plan, the new beneficiary must be related by blood or adoption to the contributor. In this case, the CESG cannot exceed $7,200. Otherwise, any excess grants must be repaid. Roll over to RRSP – You can defer the tax payable on the income withdrawal by rolling it directly into your RRSP or spousal RRSP, provided you have contribution room. The maximum rollover is $50,000 per contributor. Withdraw contributions – Contributions made to the plan can be withdrawn at anytime on a tax-free basis. However, any grants paid on these contributions will be repaid to the government. Withdraw earnings and growth – You are entitled to withdraw the earnings and growth on the contributions plus the earnings and growth on the grants (the grants themselves are repaid to the government) if you meet certain conditions. Roll over to RDSP – If the beneficiary becomes disabled, as of 2014, there is new legislation that will allow you to move the accumulated income to a qualified Registered Disability Savings Plan for the beneficiary. This can be done on a tax-deferred basis with no 20% penalty. CDSGs are matching grants that the Government will deposit into the beneficiary’s RDSP to help accumulate savings. The Government provides matching grants of up to 300%, depending on the amount contributed and the family net income. RDSP withdrawals must begin by the end of the year you turn age 60. You may withdraw funds earlier, but be sure to note that once a withdrawal of any amount is made, $3 worth of federal grants and bonds paid into the RDSP in the previous 10 years have to be repaid for every $1 withdrawn. Withdrawals will consist of non-taxable contributions, taxable Government monies and taxable growth. For full information on RDSPs and Government grants and bonds, visit the Government of Canada website. Through the CDSG, the Government deposits money into your RDSP to help you save, providing matching grants of 300%, 200% or 100%, depending on the amount contributed and the beneficiary’s family net income. The maximum is $3,500 each year, with a lifetime limit of $70,000. Through the CDSB, the Government deposits money into the RDSPs of low-income and modest-income Canadians. If you qualify for the bond, you could receive up to $1,000 a year, with a lifetime limit of $20,000. Since ETFs were first offered, they have evolved to offer a range of benefits and are managed using a variety of different approaches. ETFs remain one of the most popular and innovative investment solutions available to investors. To help address an investor’s risk profile, mitigate impact of market volatility and deliver an appropriate investment mix, we offer risk-based asset allocation solutions with ETF Portfolios. These multi-asset portfolios are constructed using a combination of Exchange Traded Funds to create a one-ticket solution. No two investors are alike. That’s why our ETF Portfolios offer five target risk profiles, each uniquely designed to maximize return potential for a given level of risk. Advised households save at TWICE the rate of Non-Advised households! The chart displays median asset levels for the Advised and Non-Advised households. 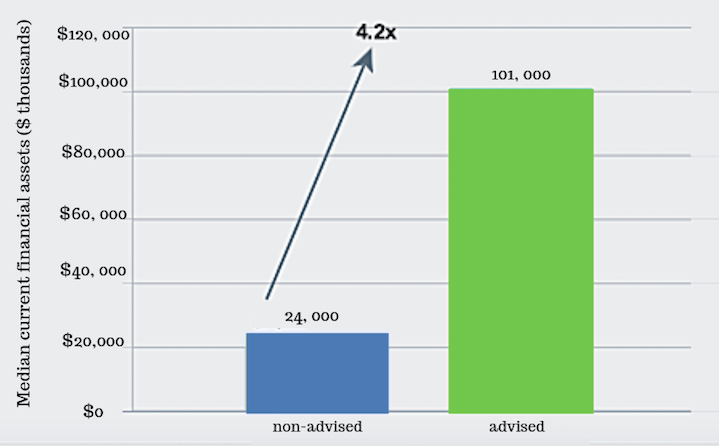 As illustrated, the Advised households have 4.2 times the median assets of the Non-Advised households. *Source: New evidence on the value of financial advice. By Dr. Jon Cockerline, Ph.D.